In the future, you won’t go to shops; instead, shops will come to you. That’s much of the idea behind the new e-Palette “mobility ecosystem” Toyota president Akio Toyoda revealed today at CES 2018, and companies such as Amazon, Pizza Hut and Uber are already looking into ways to use it. 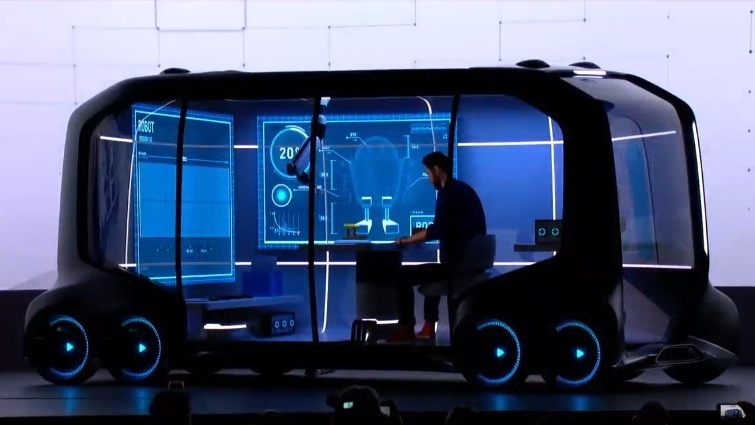 The core of the system is the new “e-Palette Concept Vehicle,” which basically looks like a small bus. It’s quite spacious, with low floors that almost touch the ground and a roomy interior that Toyota says can be outfitted for “parcel delivery, ride-sharing or on-the-road e-commerce.” Only one model is on display at CES, but eventually Toyota plans for the vehicles to come in three different sizes. In Toyoda’s words, the service should “blur the lines between brick and mortar and online commerce.” Business will essentially be able to program the cars as they wish, thanks to software tools and an open control interface that’s protected from outside interference by Toyota’s Guardian technology. Amazon, Pizza Hut and Uber are already coming up with ideas for how to use the tech, as is Mazda and the Chinese ride-hailing giant DiDi. Some of these potential uses seem fairly obvious: Pizza Hut will likely use it for pizza delivery while Uber and DiDi will use it to move passengers around cities. As for Amazon, it could be used for anything from a delivery system to a mobile storefront packed with popular items. We’ll likely have to wait a couple of years to see how that works out. Toyota will start widely testing the system in areas such as the United States at some point in the 2020s, and on the home front, Toyota plans to have the e-Palette system up and running throughout the 2020 Olympics in Tokyo.